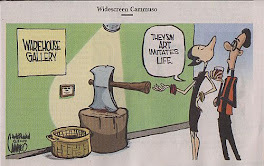 happening in the world of contemporary art. When I moved here from Chicago in 2000 I was shocked by the lack of contemporary visual arts venues and have had to significantly alter my teaching and creative research methods. Now, after 7 years, I finally feel that there is a place where I can go and bring my students and feel that we are part of the larger art movement. Teaching students by using slide lectures, texts and the internet is not the same as being able to physically walk into a gallery and experience these works of art. Astria Suparak is an extraordinary curator with passion, insight, experience, energy and a vast network of creative contacts. Syracuse is incredibly fortunate to have her and she undoubtedly is destined for greatness. Let's make sure that it occurs here as opposed to somewhere else. I trust the administration will take action and preserve our assets.